John Jancek on Media Day. Credit: Rich Kurtzman. New year, new defense, new defensive coordinator. Is John Jancek the savior of the Colorado State defense? Fans sure hope so, after multiple defensive meltdowns in 2016 and 2017 left Mike Bobo’s team deflated, finishing 7-6 in three straight seasons. In 2017 alone, Air Force was able to rush for 413 yards in a blowout of a rivalry game, Boise State was allowed to score 14 points in 3 minutes to tie and win that heartbreaker, and even Nevada scored 42 on the Rams defense. While the offense scored 33.4 points per game, the defense allowed far too many, at 27.8, which was 72nd in the nation. Things must be drastically improved on defense in 2018 if Colorado State wants to win more games, period. Luckily, with Jancek, the Rams have found a passionate and well-versed defensive coordinator, as players have explained throughout fall camp. And, it should be noted here that the Rams change of defensive coordinators also means there’s now a separate linebacker’s coach; Marty English performed both duties the last two years. Are more coaches better? Not necessarily, but it does allow Jancek to work in a role of overseeing the entire defense and not focusing on just one position group. As each group meets with their individual coaches, Jancek — the orchestrator of a defense at Tennessee which improved every, single year from 2013-15 — can explain to the D-line, linebackers and secondary all separately what improvements need to be made, in real-time. That sounds like a sure-fire upgrade. “He’s just a great guy,” safety Jordan Fogal, the elder statesmen on the defense in his sixth year of college football, said of Jancek. “They’re going to be in your face, high-energy guys. But they know how to teach us as well. They’re not just going to be ‘Rah rah’ in your face, screaming at you 24/7. For coaches, finding that balance between being good cop/bad cop can be difficult, and we’ve heard Mike Bobo talk about remaining positive all throughout camp, to see things through an encouraging lens. But, players also expect to be yelled at when they’re not performing up to par. That second bit is all fine and dandy if those young players are then getting the necessary instruction off the field, which is exactly what’s happening this year for Colorado State. It’s an encouraging change for Rams fans and players alike. Jancek is one of six new coaches for Colorado State this year, and for him to win the trust of his key contributors on the defensive side of the ball has been huge, especially this quickly. 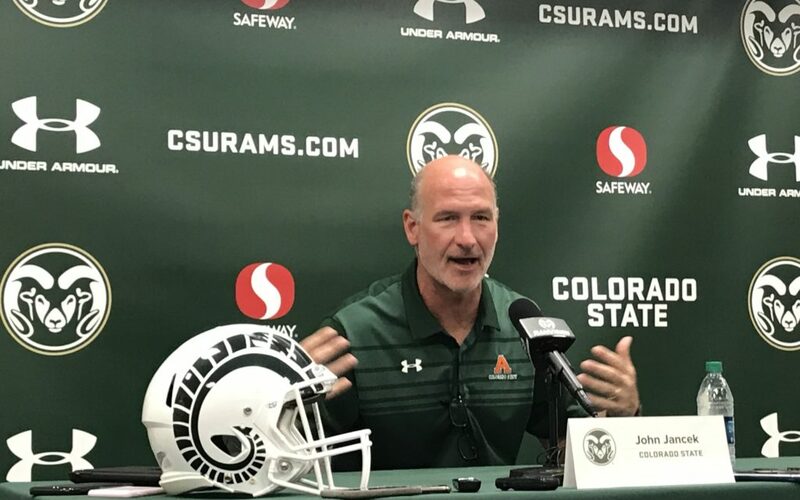 For the defensive players, the adjustment to changes doesn’t just mean learning five new coaches, it also means a switch from the 3-4 alignment to the 4-3 as CSU’s base defense. Sure, they’ll use both alignments from time to time, but the 4-3 is what they’ll “major in” as Bobo says. So, how’s the defense responded? One thing’s remained consistent for the defense during Bobo’s time in Fort Collins; no matter their age or experience, the best players will see the most playing time. That will again be true at Colorado State in 2018, but we’re also seeing some of those players who were freshmen in 2015, become the leaders now. King is one, and he’ll possibly be used both inside and outside on a defensive line which has more depth than we’ve seen in a long time. Jamal Hicks will be crucial in the defensive backfield, but the talent and experience on the back end is a vast improvement compared to recent years. And in the middle, Watson and Tre Thomas are two, intense playmakers looking to push this defense to new heights. With Bobo sidelined due to health concerns, everyone can rest a little easier knowing the leadership from Jancek — as well as offensive coordinator Dave Johnson — is keeping this team on track. In only eight days, Jancek’s new-look defense hosts the Hawaii Rainbow Warriors, with kickoff scheduled for 5:30 p.m. MST at Sonny Lubick Field at Canvas Stadium.